Most people don’t need their arms twisted to consider visiting Hawaii. The beautiful beaches, laid back atmosphere, amazing scenery, and warm weather attracts tourists year-round to the Hawaiian Islands. What many people may not know is that when the sun goes down and the sunbathers and surfers abandon the shores, there is still plenty to do in Hawaii. The islands are home to enchanting nighttime farmers’ markets that are a must-see for tourists. Farmers’ markets are a place for the local vendors to set-up concession stands and make goods available for purchase. Although local produce and other food items from local farms are staple items for sale at farmers’ markets- visitors may find a range of goods for sale from used farm equipment to flowers. Farmers’ markets are a great place for people who enjoy fresh, organic food to shop. Farmers all also on hand to answer any questions about growing practices. A typical farmers’ market is not just a place to pick up groceries. Travelers and locals in Hawaii can find ready-to-eat Hawaiian specialties next to stalls selling locally grown fruits and vegetables. Flowers, craft items, and clothing may also be found. The charm of a farmers’ market is not limited to delicious food. Storytellers, musicians, artists and performers contribute to a festival-like atmosphere. Attending Hawaiian markets can be equally relaxing as entertaining. Farmers’ markets are important for the local economy in Hawaii and all over the United States. Small farms rely on these markets to bring in a significant portion of profits. Locals also view markets as opportunities to catch-up with the news of their friends and community, and opportunities to meet new people. 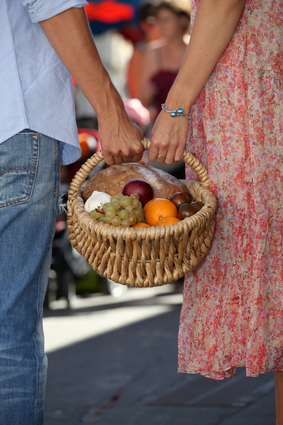 When traveling to a Farmers’ Market, be sure to have a personal shopping cart and some canvas shopping bags. This will free your hands and make shopping a real pleasure, not just a rush to empty your hands from all those bags of produce you are sure to buy. Hawaiian farmers’ markets exist in several areas. The Island of Hawaii (The Big Island) hosts the Kailua market year round- this twilight market offers guests local Hawaiian treats and fresh Polynesian cuisine. OrganicAuthority.com calls it a “must do” attraction. Visitors can sample tropical treats, including lavender butter, coconut jam, dragon fruit, and kale chips. Tourists can find excellent souvenirs like Hawaiian crafts to take home. Although nighttime markets create a unique atmosphere, many Hawaiians prefer to get up early and go to the market during the day. The Ala Moana Center in Honolulu hosts a farmers’ market on Saturdays from 8 a.m. to 12 p.m. Visiting a farmers’ market on a Saturday morning is a great way to kick off the weekend. A little later on Saturdays, farmers’ take goods to Kaiser High School for the Hawaii Kai farmers’ market. The market is open from 9 a.m. to 1 p.m. The Haleiwa farmers’ market is a local hot spot on Oahu known for it’s delicious sea asparagus, seafood, and jams. Visitors can find a variety of items for sale, including vegetarian lunches and crafts. The market is well-known for its sea asparagus tent and covered seating area complete with shade, table clothes, and frequent entertainment from street performers. Although one of the largest of the farmers’ markets in the area, Haleiwa market, is temporarily closed, according to Hawaii Web TV website. Organizers are looking for a new home for the market and locals are fighting to have it reopened. Hawaiian all-day markets offer tourists a chance to experience the culture and spirit of Hawaii in a unique way while helping to support small businesses.